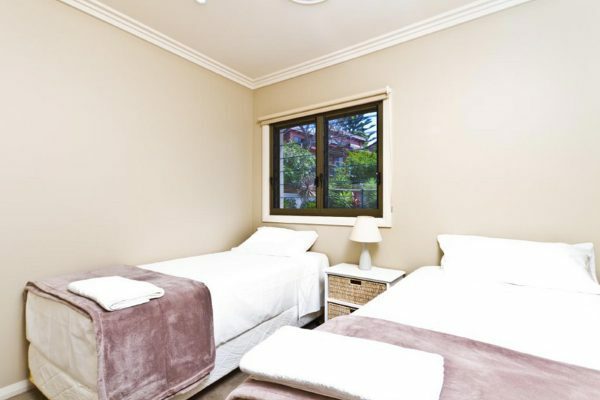 Any Four of the Five bedrooms can be changed from single/twin to double (king) option. We simply join the single beds together to form a double bed – as most European hotels do. (Advise us at least one week before arrival.) This allows many options whether they be adults or children. Children under age TWO are no charge – 2 portacots and 3 high chairs are available at no charge. It is possible to use most sleeping areas as twin single or king except the Bunk Room which accommodates up to 4 persons and cannot be altered. For taller guests, the bunk beds are 195cm long. Bedrooms 1-4 can be set up as twin singles or as double (king) beds. Please note that the Bunk Beds may be a challenge for adults. The mattresses are top quality pillow top with foam and inner springs. 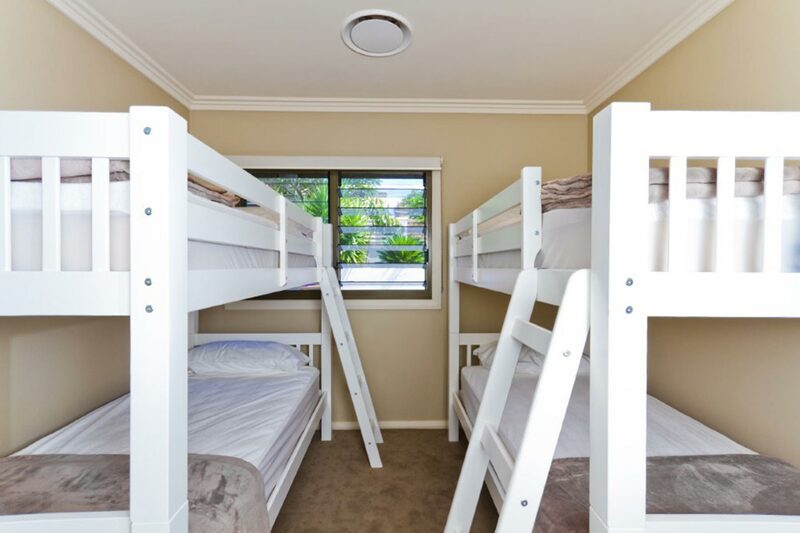 Bottom Bunks will suit anyone, however the Top Bunks need to be accessed by a three step ladder as pictured. 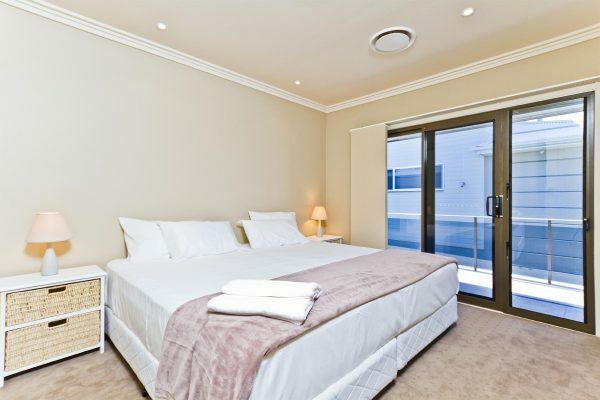 Linen hire includes Hotel Quality laundered crisp white sheets, pillow slip, hand and bath towel. All rooms have louvred windows. 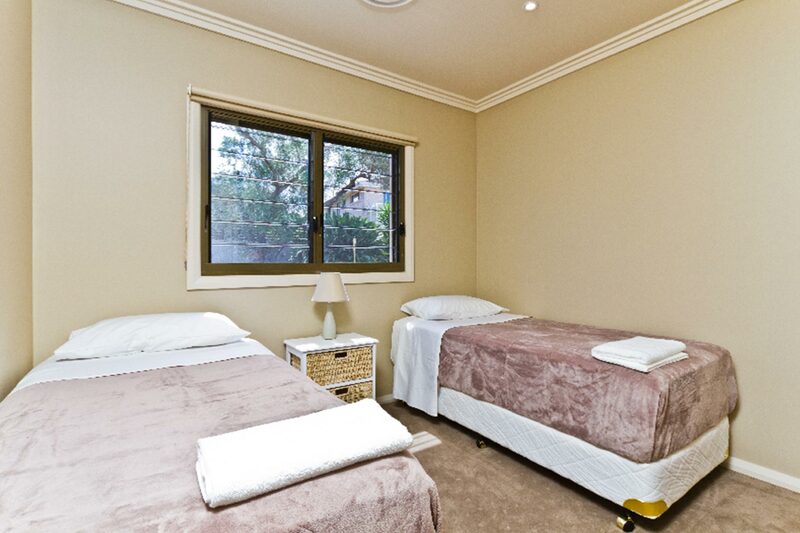 Bedrooms 1 & 2 have ocean views, Bedrooms 3, 4 & 5 have garden views and you can hear the sea from all rooms. Four of the five bedrooms have generous floor to ceiling built-in wardrobes, all beds are fitted with premium mattress and pillow protectors and supplied with light yet warm micro-fibre blankets. The remaining bedroom (The Bunk Room), has two double bunk beds, one on top of the other, suitable in size for four adults or children. We would not recommend the top two bunks for children under the age of 5. We do admit that the bunk room (Bedroom 3) is a bit of a squeeze for 4 guests as it is the only bedroom that does not have a wardrobe, but there are 2 adjacent wardrobes for this room’s use. 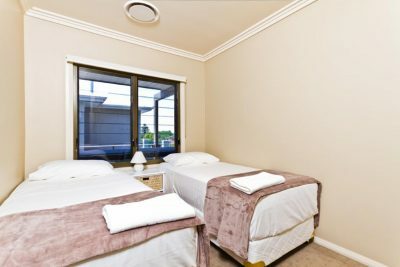 All rooms have louvred windows that offer natural ventilation, alternatively reverse-cycle air conditioning is ducted to all bedrooms and living areas. This guarantees comfort in summer or winter. The Bedroom areas are designed to seperate easily into two sleeping areas by simply closing the front or back door of Bedroom 3 which is located between the sleeping areas of Bedrooms 1 & 2 and Bedrooms 4 & 5. The L shaped reading room, complete with a Sony Bravia 42″ High Definition Digital LCD TV and many other features can also separate these two sleeping areas. This separating feature is very handy when infants or young children are going to bed early or when groups want to watch different television programmes in different areas. Bedroom 3 is able to be closed off to either the front or the back area or kept open, depending on the level of privacy required. Access to the living areas from the back rooms can be alternatively gained through the covered wrap-around balcony without having to go through Bedroom 3.